Codling moth (CM) -- Codling moth development as of August 4: 2nd generation adult emergence at 66% and 2nd generation egg hatch at 27%. 2nd generation 7% CM egg hatch: July 28, Tuesday = target date for 1st spray where multiple sprays needed to control 2nd generation CM. 2nd generation 30% CM egg hatch: August 5, Wednesday = target date where one spray needed to control 2nd generation CM. Spotted tentiform leafminer (STLM) -- 2nd STLM flight begins around: June 15, Monday. Rough guess of when 2nd generation sap-feeding mines begin showing: July 5, Sunday. Optimum first sample date for 2nd generation STLM sap-feeding mines is July 12, Sunday. Second optimized sample date for 2nd generation STLM sapfeedimg mines, if needed: July 18, Saturday. Third optimized sample date for 2nd generation STLM sapfeeding mines, if needed: July 28, Tuesday. The primary reason I am putting out Healthy Fruit this week is to include Duane Greene's comments on ReTain because the time of application may be as early as next week for some growers. The pest management season is really winding down, so beginning with the next Healthy Fruit we will focus on harvest maturity. 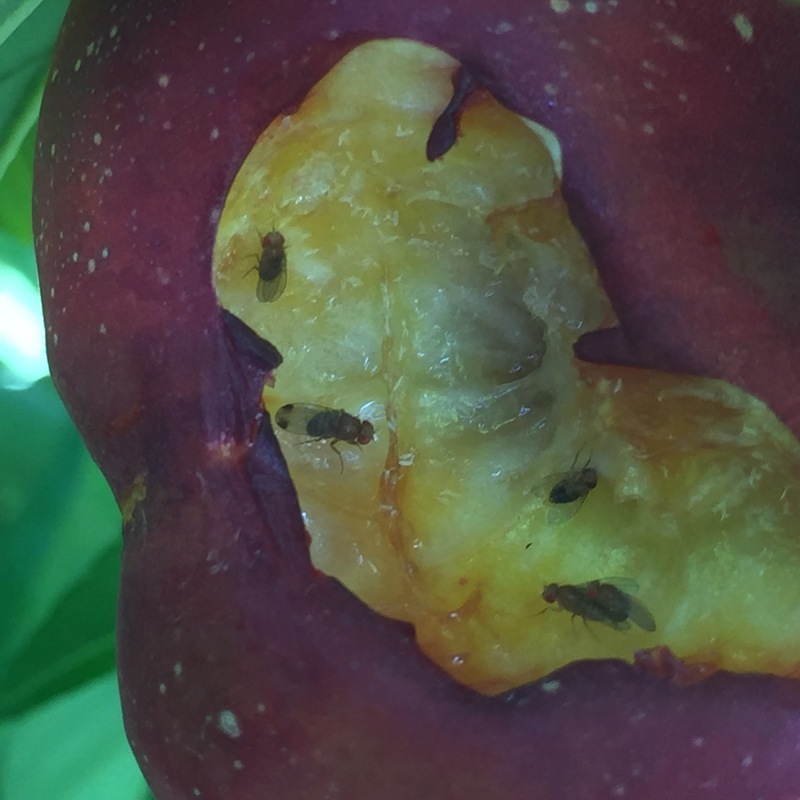 Spotted wind drosophila (SWD) has been found in peaches (as well as appearing in other crops). As long as you keep up with peach harvest, ie.don't let fruit get too soft, SWD should not require insecticide treatment in peaches. Please note we are in the peak of apple maggot fly (AMF) season, so be warned. Prophylactic insecticide sprays against this pest are strongly advised. 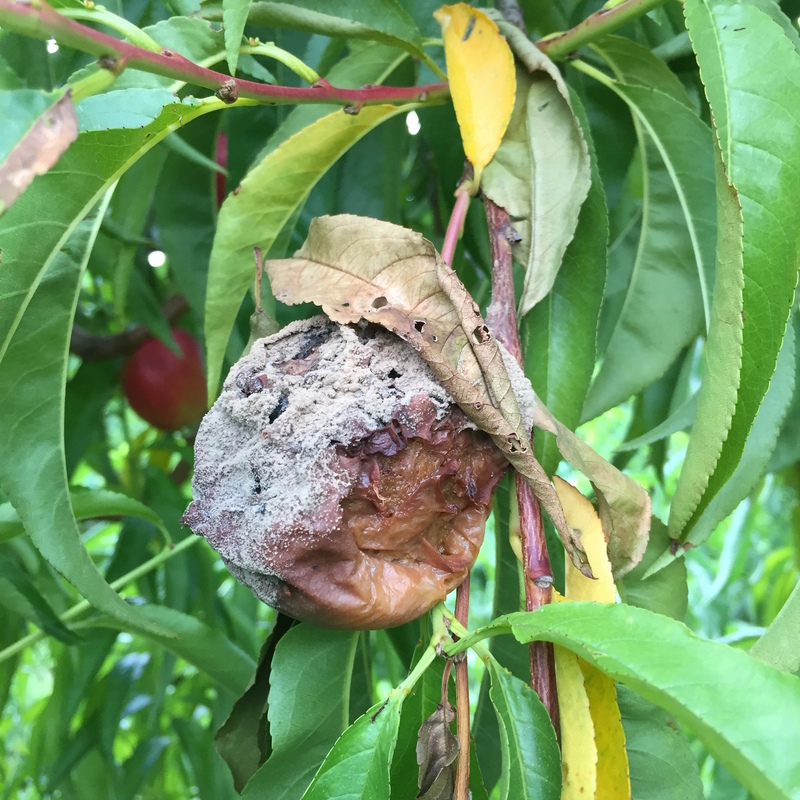 Summer diseases (fly speck, sooty blotch, rots) of apples need to be controlled with repeated fungicide applications where and when it rains, or 2-3 weeks pass. Now is still a good time to collect leaf samples for nutrient analysis. (But you should do it in the next week.) Please visit the UMass Soil and Plant Tissue Testing Laboratory for forms and instruction on submitting samples. Samples should be collected by mid-August at the latest. The purpose of this is to provide a brief update on ReTain use for 2015 and to call your attention to small changes that Valent has made to the ReTain label. The more ReTain you apply the greater the response (more drop control and greater delay in fruit maturity) you can expect. In general, this is a linear response. The earlier you apply ReTain the greater retardation of ripening will occur. Effective drop control (20% or less) from a 1 pouch per acre application will generally last between 34 and 40 days. Supplemental application of ReTain will be required to achieve additional drop control. Supplemental application of ½ to 1 pouch per acre will extend the period of drop control and continue some retardation of ripening. It requires 10 to 14 days after ReTain application before drop control start to become effective. Valent has released a Supplemental Label for ReTain this year. Among other things, the new label allows application of up to two pouches of ReTain per acre at the initial application. It is unclear at this point if there is a season limit. This will probably be made clear once the rewrite of the federal label is approved later in the year. If you would like to delay fruit maturation to allow later harvest, application should be applied at least 4 weeks before the anticipated start of harvest. At least one pouch should be used at this time to have a meaningful delay in ripening. Presumably, if more than one pouch is applied a greater delay in ripening will occur. A supplemental application may be useful if harvest is delayed. There is a 7 day pre-harvest interval. Application of ReTain 3 to 3½ weeks before anticipated harvest will have less of an effect on delaying ripening than the earlier application. The supplemental label suggests that application at this time will allow delay of harvest 7 to 10 days. While starch breakdown is delayed by ReTain, it is not a large delay. Below is a summary table of starch rating recorded over the past 6 years using the Cornell Generic Starch Chart and flesh firmness of fruit that were treated 3 to 3½ weeks before the anticipated start of harvest and data taken between September 7 and 15. The six year average shows a 0.8 starch unit reduction for ReTain treated fruit and only a 0.4 lb increase in flesh firmness. It should be stressed that loss of flesh firmness does occur at very nearly the same rate in ReTain treated fruit as the untreated control fruit so a delaying harvest does come at the expense of lower flesh firmness. Flesh firmness is a significant factor when determining the length of storage time and this should be considered. Perhaps the most visible effect of early ReTain application is the delay in red color development and the intensity of red color. Starch rating (Cornell Generic Starch Chart) and flesh firmness of Gatzke McIntosh apples treated with 1 pouch per acre of ReTain 3 to 3½ weeks before the anticipate start of harvest. Data taken from harvests made on September 7 to 15. If drop control is desired into late September or early October supplemental ReTain application will be necessary. In the past two years significant drop control into early October was achieved with an application of a second pouch per acre of ReTain applied 2 weeks after the first application. Application can be delayed for up to 2 weeks prior to harvest but some early drop may occur. Depending on the year sometimes this loss may be substantial. We do not recommend the addition of NAA with ReTain for drop control. While improvements I drop control were documented one year there were several year where this was not observed. ReTain masked most of the ripening effects normally attributed to NAA use at harvest time, we did observe fruit cracking on the tree and fruit cracking and extremely soft from of a portion of the fruit (1 to 3%). While the percent is not great it is real and eliminating these from the stored bins can be difficult and expensive. Both Gala and Honeycrisp are considered low ethylene producing varieties. Consequently, they are much more sensitive to ReTain application than other varieties that produce more ethylene. Experience has shown that the use of one half to one third of the amount of ReTain is appropriate. If higher rates are used then ripening can be delayed of up to a month and red color development can be dramatically reduced and delayed. Since Gala do not have a drop problem the primary use of ReTain is to delay ripening to prevent or delay fruit cracking and the development of greasiness. Honeycrisp does drop and sometimes this can be severe. This is exacerbated by high temperature and a lack of rain. Consequently, it is important to make sure Honeycrisp are provided with adequate water and make sure that the ReTain is applied advance of exposure of Honeycrisp to these stresses. The next Healthy Fruit will be published on Tuesday, August 18 or thereabouts, 2015. As always feel free to get in touch with any member of the UMass Fruit Team (http://extension.umass.edu/fruitadvisor/team-members) if you have questions or comments.